On 7th and 8th of July I will be holding a seminar at Stars Gym in London. Mati Parks who is the owner of the gym and the trainer of some great fighters himself contacted me to see if I’d be interested in doing this event at his gym. Also on the day there will be a three hour NLP session with Vinny Shoreman. I have gone myself to see Vinny on many occasions prior to fights to help focus my mind at the task in hand. I really would recommend this for anyone not just for fighting but for any goal you’d like to achieve. There will also be nutritional advice given by personal trainer Karolina Kraczor and life coaching by professional performance coach Joy Crowther. Here is the itinerary of the weekends events. 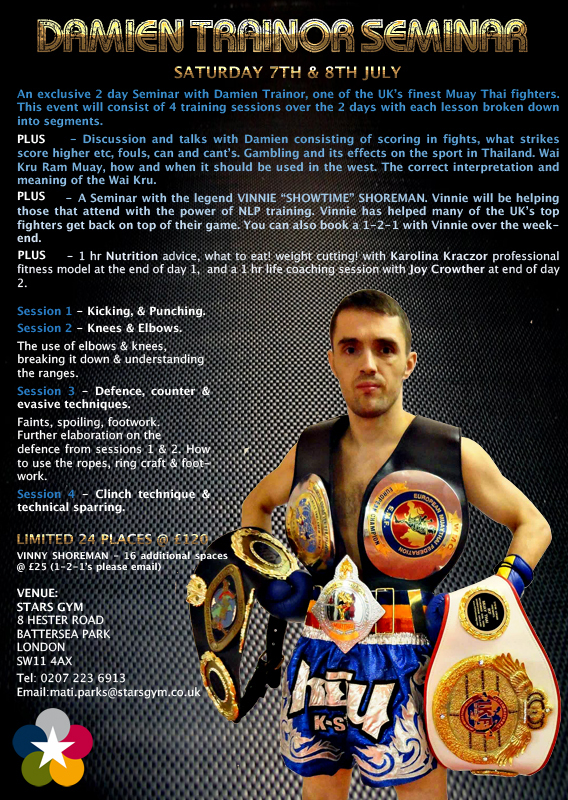 Damien Trainor Thai Boxing Seminar – The science of Muay Thai. 10am – 11.30am: Session 1 – Punching and kick techniques. Different variants of Kicks and when and how to use these different variation of kicks at ranges close and long. Punching, difference between Thai punches and western style boxing. To also elaborate on blocking techniques for punching and kicking and counters. 12pm – 2pm: Discussion and talks. To discuss scoring in fights. What strikes score higher etc, fouls, can and cant do’s. Gambling and its effects on the sport. Wai Kru Ram Muay, how and when it should be used in the west. The correct interpretation and meaning of the Wai Kru. 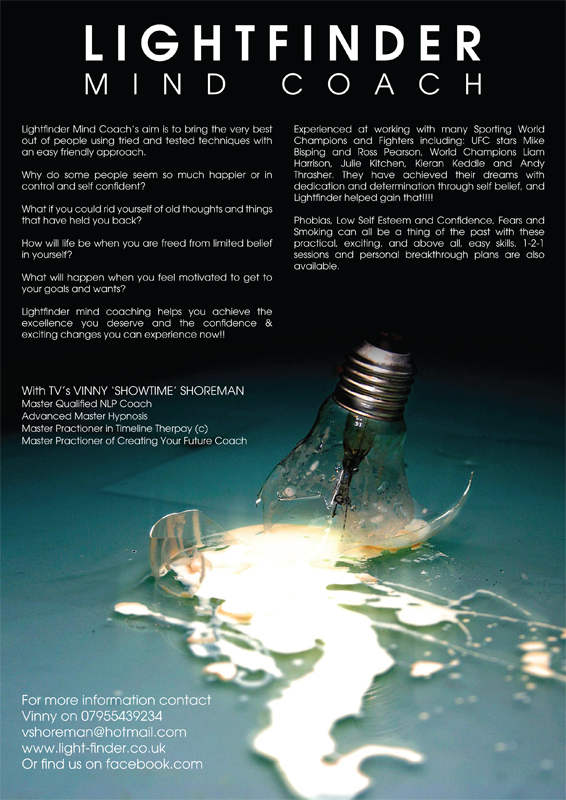 12pm – 3pm: NLP Session with Vinny Shoreman. 4pm – 5.30pm: Session 4 – Clinch technique and technical sparring. Correctness in Clinch, placement of feet to improve balance and core strength and placement of hands in clinch. Possible ways to improve strength for clinch work. Do’s and don’ts. How to be able to work fast and effectively when sparring without applying weight, power and strength so not hurting your sparring partner, learning self control and being aware that sparring is about learning and not fighting and merely a tool to learning how to fight. not to be missed! who's joining?